Taking bricks out of a wall can be a messy job. A commonly used tool for such a task is the diamond blade on an angle grinder, which is used on many materials such as brick, stone, and concrete. 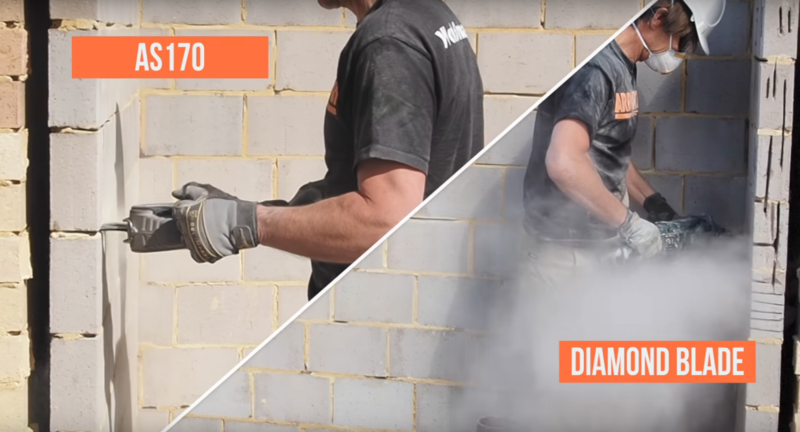 A diamond blade on an angle grinder can create quite a mess when cutting brick or block out of a wall. This is more than just a matter of time-consuming cleanup; dust from the mortar becomes airborne quickly and can create a foggy haze in the area. This airborne dust is a health hazard—anyone exposed to it is at risk for silicosis (a disabling and potentially fatal lung disease). Luckily, there is a tool that makes cutting masonry materials cleaner, safer, faster, and better. The AS170 is a completely dry cutting tool that does not use any water. The AS170 does not spin like a diamond blade on an angle grinder. It has a unique orbital cutting motion, which utilizes 2 blades simultaneously (one back and one forth). This unique patented orbital cutting technology results in larger particles that fall to the ground (like pouring sand out of a bag) instead of becoming airborne dust. The AS170 makes it possible to cut brick out of a wall, even indoors, with very little cleanup. Another benefit of the AS170’s unique orbital cutting action is that there is very little kickback, allowing for a safer and a much more accurate cut than a diamond blade on an angle grinder. 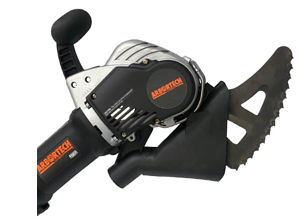 Make precise, clean, square cut outs without over cutting, faster and in a safer manner, with the Arbortech AS170. To learn more about the AS170 or to receive a quote, contact Trowel Trades Supply. We are official Arbortech dealers and can help you find the right products for your needs.